With only three days left to Christmas, there is a mad rush of activities as we cook, bake, shop, travel, and prepare for the celebrations ahead. It is a joyous time as family and friends get together to renew ties and enjoy the holidays. While we are busy with all that, let us also reflect on why we celebrate this time. Christmas is a celebration of Christ’s birth and if there was no Jesus, there will be no Christmas. Christ is the reason for the season. Let us be thankful that He came to give us abundant life. Hallelujah! I have one last batch of cookies to make and I should be done with the holiday baking. Hopefully I can then turn my attention to the Christmas Eve dinner and Christmas gathering menu. 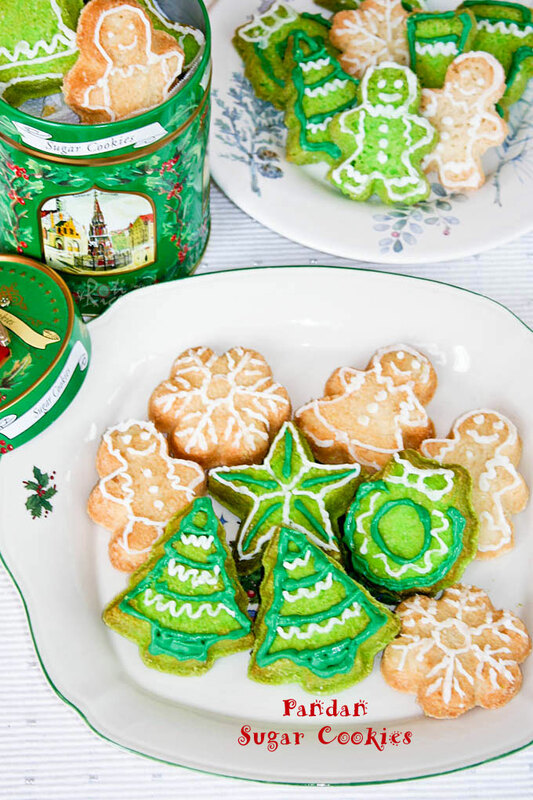 Beautifully decorated Sugar Cookies are a must at this time of the year. To make mine a little different, I have decided to flavor them with pandan paste. This paste was purchased during my summer vacation to Malaysia. If you do not have pandan paste, please use vanilla extract. I have made two versions of this Molded Sugar Cookies. Both are egg-free. One batch is made using regular all-purpose flour while the other is gluten-free. The cookies with the all-purpose flour has an almost cake-like texture while the gluten-free ones are a little crunchy. The pandan flavoring gives it a nice fragrance and color. 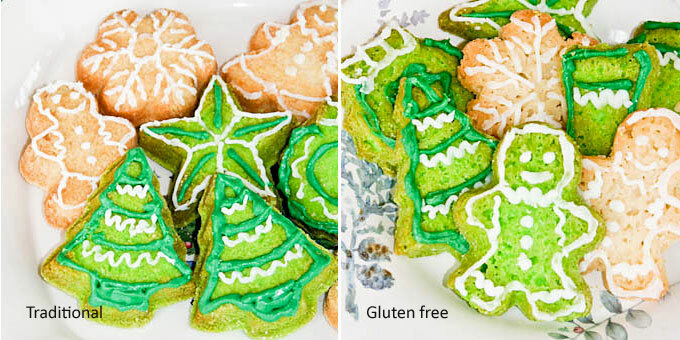 This Wilton Christmas Cookie Shapes Pan made it possible for the gluten-free cookies to retain its shape without which they will just be like flat pancakes. They also work great with the regular all-purpose flour cookies. There is no need to roll out the dough and cut them into shapes. Simply press the dough into the mold and you get perfectly shaped cookies. The release is also superb. I really enjoyed using the pans and I am glad I bought two instead of one. These are the Gluten-Free Molded Sugar Cookies. They are a little crunchy with little holes in them as they were bubbling in the pan while baking. The cookie pans allow them to retain those cute shapes. These are the Traditional Molded Sugar Cookies made with regular all-purpose flour. They are more dense and have a cake-like texture. If you are using cookie pan, press dough into pan cavities, filling two thirds full. Bake in 350°F oven for 8 to 9 minutes. Cool in pan for 10 minutes. Remove and allow cookies to cool completely on a wire rack. Decorate as desired. If you are using cookie cutters, wrap dough in cling wrap and chill in the fridge for 30 minutes. Remove and roll out to ¼ inch thick on a lightly floured surface. Cut into desired shape and place on cookie sheet 1 inch apart. Bake in 350°F (180°C) oven for 8 to 9 minutes. Allow to cool on cookie sheet for 10 minutes. Remove and allow cookies to cool completely on a wire rack. Decorate as desired. Please be sure to check back on December 31st for my 1st Blog Anniversary and the giveaway. You don’t want to miss the chance to win an autographed copy of a book I have chosen specially to commemorate the occasion. What a great recipe that can be enjoyed by people with all sorts of dietary restrictions. I love the cute shapes you used…and your decorating skills are stellar! 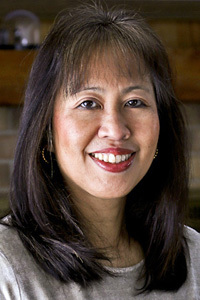 Thank you so much for sharing with me and your kind words on my blog. Happy Holiday! Those are so cute!!! And musical tins, I’ve never seen/heard such a thing. That’s so sweet. those cookies r v cute n lovely…! !nice click too! Amen and amen to your first paragraph. The cookies are outstanding and I’m thrilled that they’re gluten-free. My aunt is so it’s nice to have something sweet to offer her. Thanks for sharing. These are great cookies! I love the green ones. The pandan gives them that color? I also think these pans are great and definitely save time on shaping cookies. Merry Christmas, Biren, to you and your family!! Yes, Victoria, the pandan paste has green food coloring in it. Extracting the juice from the pandan leaves will give better flavor but you need quite a bit of leaves and it is more suited for steamed or more custard-like desserts. It is much easier to use the paste for cookies. Merry Christmas to you and yours as well! You’ve made some beautiful cookies for this holiday season. I do like that cookie pan you’re using! I’m ashamed to admit, but I don’t know what pandan is. 🙁 I will need to look into it. Great post! Those cookies are so cute and look yummy! Sounds like you are on track with all the holiday prep. I am so behind. Biren, I love your idea of using pandan paste as I love the taste and aroma which pandan gives off. Such a perfect colour for wreaths and Christmas trees too. 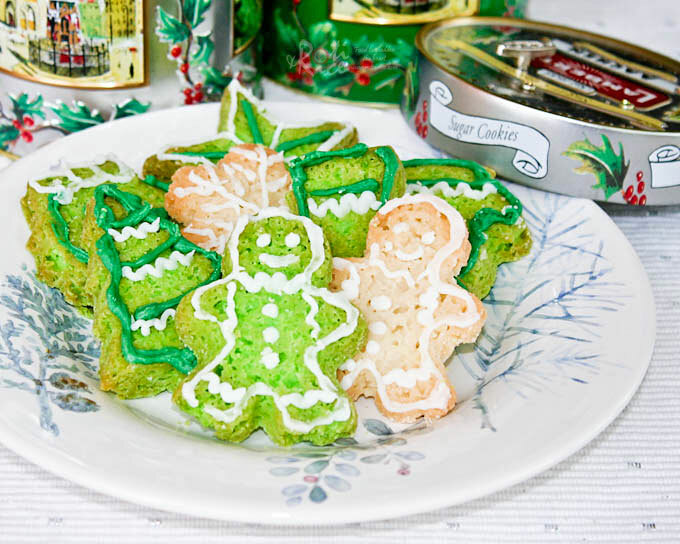 And why not green gingerbread men as well? I love your Christmas spirit here. 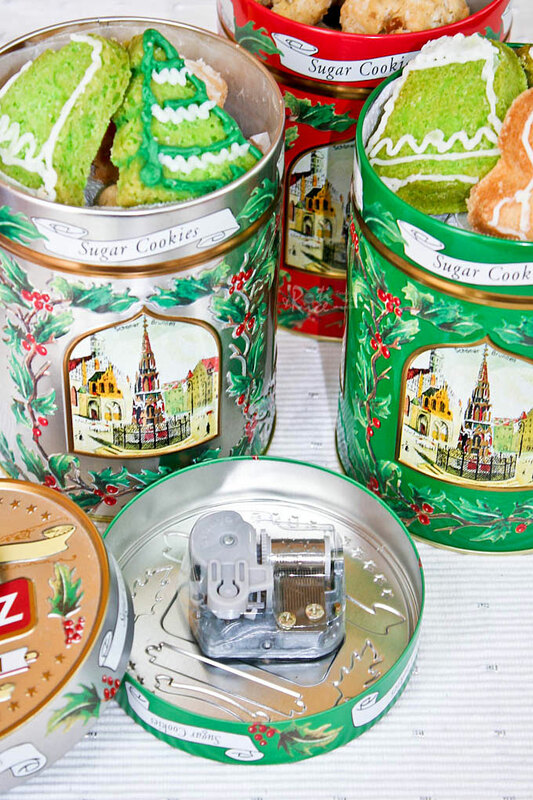 Your musical tins and shaped cookie pans are awesome. So smart of you to buy those three tins for yourself to use as cookie tins. Hope you and your lovely family have a happy holiday and very Merry Christmas, Biren! 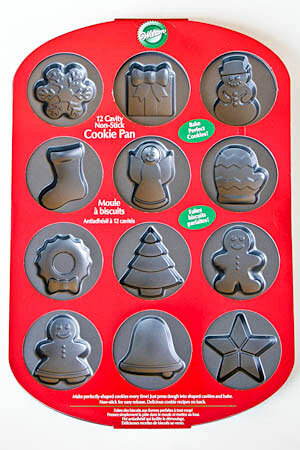 I love this cookie pan! I want to get one now too 🙂 You did a great job with the decorating, and I love that you infused pandan into the cookies. Have a very merry christmas, Biren! I just love those cookie pans. Lovely yummy looking cookies too! I’ve normally only seen pandan flavoured cake or bread, putting it in cookies is a good idea! Hope you and your family have a wonderful Christmas. And will definitely be back for this giveaway ;). I’m more curious to see what the book is haha. Merry X’mas to u, Biren! This post has brought so much X’mas cheer 🙂 Oh, I love those musical tins & I can’t believe u bought them at a bargain. Love those cookies u’d made! What a beautiful gift Biren! Gotta find me one of those cookie tins. Merry Christmas. Wow! Biren I love that cookie mold. Wish you were near and I could have asked my Christmas gift 🙂 of course this cute cookie mold. Merry Christmas to you and your family. Musical tints!? really!? I need to check it out! I like the pandan flavor that you put and the 2 versions you offered. The green suits well with Christmas theme. Oh, I love your cookie molds too! Wishing you a Merry Christmas Biren! Beautiful cookies Biren. I love your opening paragraph. Jesus is the reason for the season, and I’m thankful for that. Wonderful cookies! 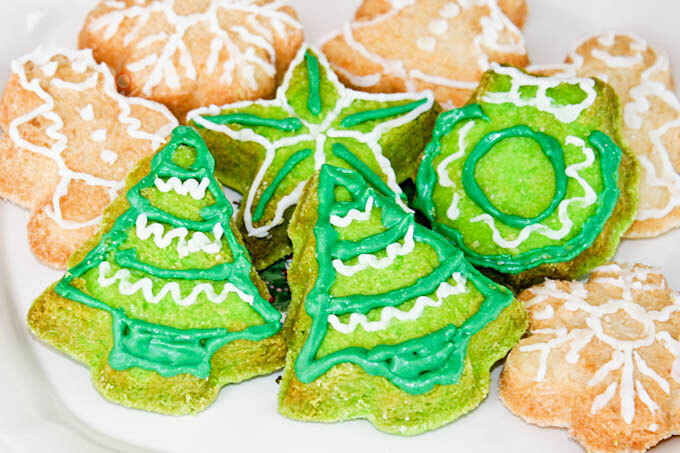 I love pandan there which gives the cookies a festive green look! Wish you and yours a merriest Christmas! 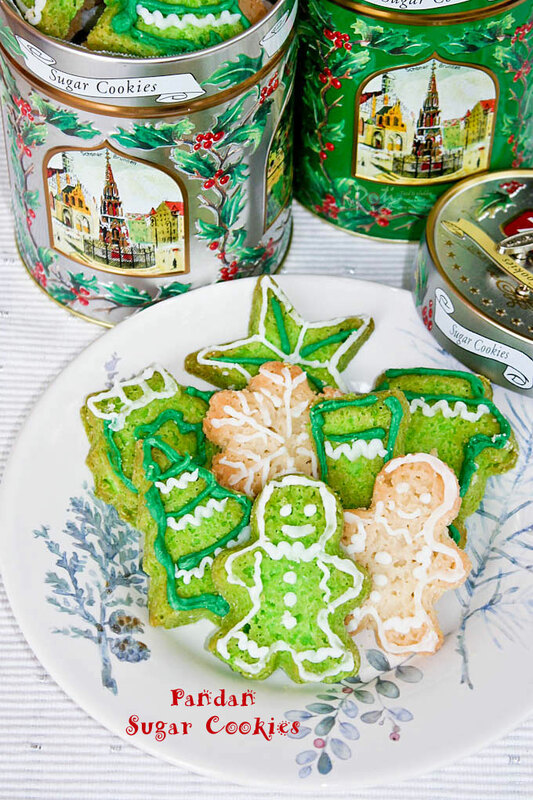 Lovely cookies and intricately designed tins. Merry Christmas to you. These look so delicious! I bet the pandan paste gives them such a nice flavor. Biren, your cookies look great! Here’s wishing you and yours a very Merry Christmas! Happy Christmas to you and your family. I love your pandan flavoured biscuits as this has now given me an idea of what to do for the same type of pandan paste sitting in my larder. Unfortunately, due to the festive eating and more eating to come, I shall have to try these biscuits next year when the waistline reduction programme is back on track! Here’s wishing you and your family a wonderful start to a prosperous and healthy new year. Keep those recipes coming! I also bought one of those musical tins filled with cookies. It’s very novel and though the music mechanism on mine no longer functions, I still have the (by now rusted) tin because it’s so pretty! I hope you and your family had a wonderful Christmas, Biren! These cookies are beautiful, I love the pretty shapes. And they sound delicious with the flavor of pandan! I love how you made a batch for those that are gluten free. I really need to direct my friend over to your blog. She’s gluten free and would love all the tasty goodies you cook up! I hope you had a wonderful holiday and I’m looking forward to your blogiversary bash! Wow…beautiful cookies. Love those pans. I need to look for them. Hope you have a most wonderful Christmas. Wishing you everything nice and lovely in the coming year! Biren this is such a lovely post, and your cookies are gorgeous! What lovely cookies out there, Biren. Like the color and texture, perfect.